Keep track of the time while you read. 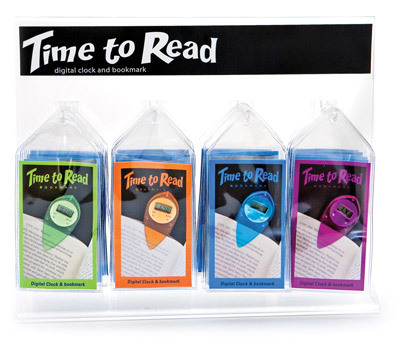 This well designed bookmark slips neatly over your page to hold your place. 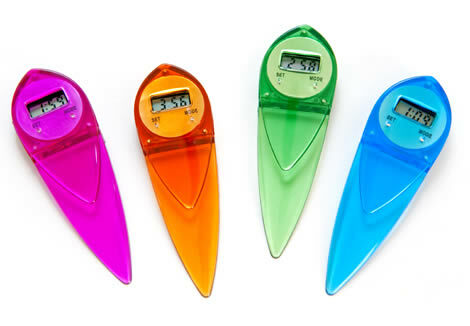 It comes in 4 colors, green, orange, purple & blue. Each bookmark is in a vinyl sleeve and measures 2.75" w x 6"h. These bookmarks come in packages of 6. One 4 hook display option is available. Replaceable watch batteries keep this digital clock running like new.